Olympia Garage Doors, your #1 service choice. When your garage door breaks down, you loose access to your home and loss of protection for your vehicles. If you're like most people, it's a place to store valuables as well. 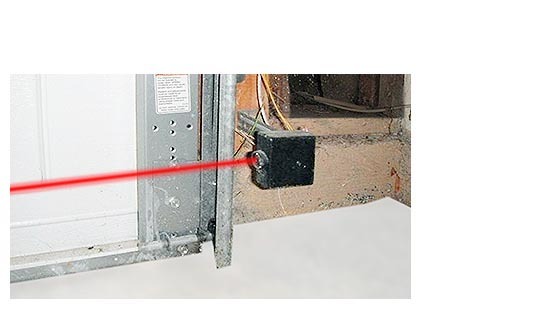 As the largest and heaviest mechanical device in your home, a typical garage door opens and closes more than a thousand times in a year, and even more with an on-the-go family. So it's no wonder garage doors will need attention sooner or later. To keep your home secure, and as a first-line buffer for your home against stormy weather, you need a company that is committed to giving you quick service. And a commitment to get your garage door operational once again. 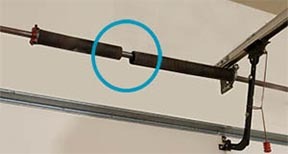 Garage doors break  We repair them fast! When your big door needs service, repairs or replacement, call the professionals at Olympia Garage Doors. With a customer-first attitude, and a wide-range of garage door repair services, experienced professionals have the tools and training to get your garage door garage door operational as soon as possible. 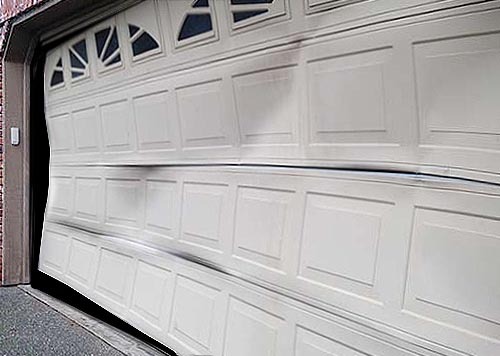 Crashed, crunched and battered garage doors might have some related damage to the opener motor, cables or support structure. This could be a potential safety hazard. We will inspect your garage door for damage and advise you accordingly. Our free estimate could, for example, include replacement panels. However, if the door is damaged more severely, as pictured, a new garage door will need to be installed. 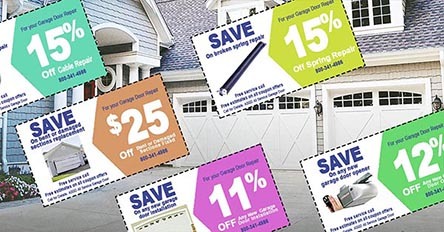 Get a coupon and save on your next garage door repair or new garage door! Is your garage door not opening or closing right? If your garage door is stuck or operates less than normal, call the professional team at Olympia Garage Doors for a response you can count on. It is imperative that you have access to your garage door during your normal routine, and we take your problem seriously with a response as quickly as possible. Is your opener motor not working? Cables snapped? Broken springs? Garage Door off-track? Misaligned photo eyes? Call us and and we'll attempt to isolate the problem based on your description (sometimes we've been able to help you solve a minor problem over the phone). But if the issue is major, or can't be addressed over the phone, a skilled technician from Olympia Garage Doors could be dispatched to your location to determine the exact cause of your garage door malfunction. Then you'll receive a free quote. 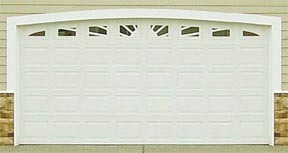 Olympia Garage Doors is the South Puget Sound leader in garage door services, repair and replacement garage doors. Experienced technicians are ready to respond to your garage door requirements. The company is licensed, bonded and insured. With trucks virtually stocked and stacked with durable parts and tools, our goal is to completing your job with satisfaction in just one visit. A horrible, ear-splitting, no good garage door squeaking and creaking sound could be an audible signal that your garage door is on a countdown to a breakdown. 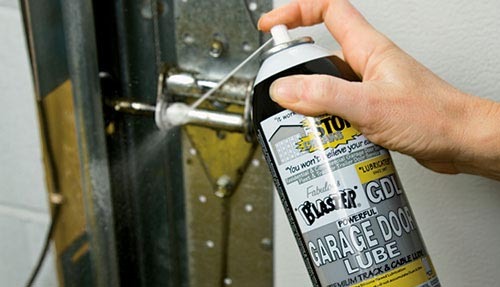 But first, try some garage door lubricant. 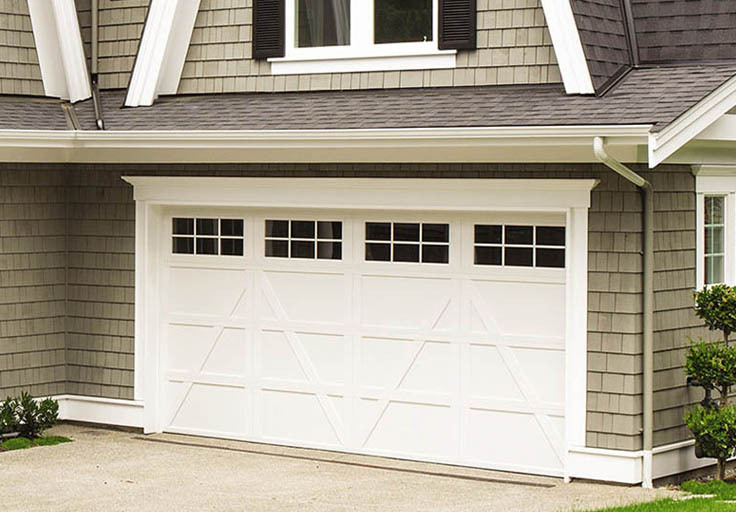 Is your garage door not closing entirely, or opening after it touches the floor? It could be a serious problem that calls for our professionals, but it just might be something that you can fix after a brief inspection. 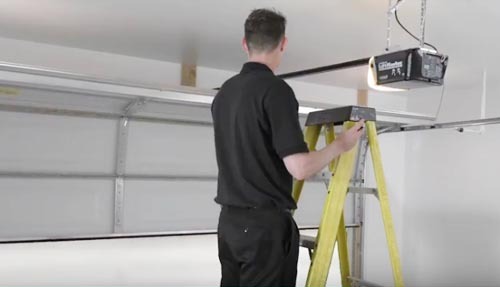 You can always count on Olympia Gargae Doors for sterling service and skilled repairs on name-brand makes and models of garage doors and openers. Experienced garage door technicians, who go through drug testing and a background check, are highly trained to repair your garage door problem, installation or opener malfunction. The company sources products only from reputable manufacturers who offer top-qualify inventory. 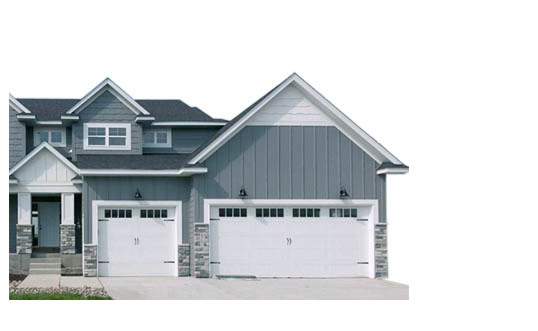 With a combinaion of over three decades of local, trustworthy service and quality products, Olympia Garage Doors provides the assurance that all your garage door service needs will be supplied and applied with excellence. How to keep your children and family safe when near garage doors. 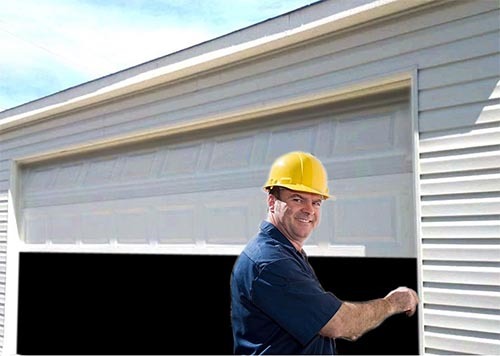 Parent company specializes in garage door repair, service and installation. Our door supplier is Northwest Door. Like us, they're family-owned, local and customer oriented. Call Olympia Garage Doors today with your garage door questions. Ask for details about our free on-site quote for repairs, safety issues or a new garage door. © ASGD. LLC. All rights reserved. Design: HTML5 UP. Content: Imagination Works.